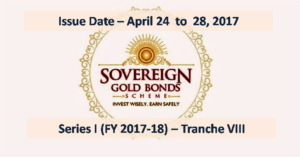 Government of India has launched the eighth tranche (Series I for FY 2017-18) of Sovereign Gold Bonds from April 24 to 28, 2017. These bonds are investment scheme where investors could buy gold in the form of Gold Bonds from Government of India. Price of each Bond: Rs 2,901 per bond [A discount of Rs 50 per gram has been offered (2951-50 = 2901)]. The last 7 tranches of Sovereign Gold Bond are listed on stock exchanges and trading between Rs 2,750 to Rs 2,825 per bond (as of April 21, 2017). The prices are definitely lower than the fresh issue but the problem is you may not be able to buy as the traded volume is very low.